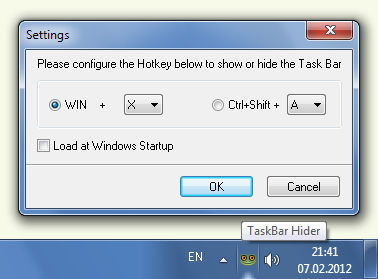 TaskBar Hider allows you to hide and show the Windows TaskBar panel by pressing user-defined hot key. How to extract: Download the ZIP package and extract to a folder of your choice. Launch TaskBarHider.exe. 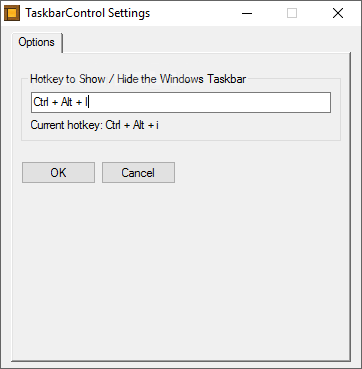 Hide Taskbar is a simple utility to hide or un-hide only the Windows taskbar using hotkeys. This is triggered with Ctrl+Esc. Note that the Start button is still visible and Windows will not maximize to fill the screen in the space where the taskbar was located. How to extract: Download the ZIP package and extract to a folder of your choice. Launch Hide Taskbar.exe. "... visually hide or un-hide only the taskbar ..."
"... you love a clean desktop and don’t want even a taskbar to mar your wallpaper ..."
The screenshot itself also merely shows off the interplay between the start button and wallpaper. Ah am I missing something, what does this do different than auto hide taskbar setting? Yeah I no it leaves the start button but is that really so helpful more than auto hide? Maybe its just me and I ain't tryin to be a hater I'm jus sayin. Taskbar Control allows hiding/un-hiding the taskbar, including the 1 pixel line that "Auto Hide" displays, without changing a permanent system option. The program's default keyboard shortcut is Ctrl+Alt+I.